Hippocampus adults are graceful sights; they move through water with great poise. Magis often use these creatures in their searches for eggs, their powers helping them to ride far beneath the waves. Special saddles made out of vines are usually constructed for such occasions, as it is hard to keep your seat. These large animals easily dislodge riders not prepared for the speed at which a hippocampus travels. These creatures, like the narwhals, are migratory, traveling to and from the Arkene and islands. In winter they leave for warmer climates, often bringing their magi with them for an appreciate respite. Hippocampuses makes their nests from soft grasses, pulled from river banks. Like all magical creatures, there is never more than one egg at a time. Hippocampuses will protect their nests diligently, attacking all that come near. Magis, however, are trusted greatly, and these aquatic beasts have been known to present a deserving student with an egg. Hippocampuses are beautiful aquatic creatures, rarely glimpsed and commonly believed to be nothing more than a myth. 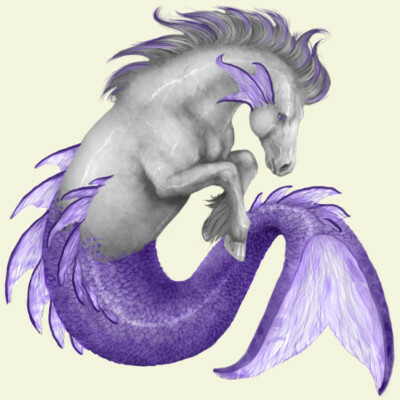 Living far beneath seas and oceans, they are a gorgeous melding between equestrians and the creatures of the deep. They come in many colors, but the more exotic species reside far beyond the reaches of even magis. In watery depths where only krakens reside, hippocampuses live, nibbling fields of sea grasses. Most of these creatures are beautiful shades of purple, ocean blue, and a green the color of seaweed. They share the power of the koi, enabling those who ride them to breath for a time under waters. Capable of great speed due to an incredibly strong tail, hippocampuses make useful steeds when traveling watery lands. Whole herds of them can sometimes be glimpsed, moving to new feeding grounds or migrating.